Phagwara: Prime Minister Narendra Modi on Thursday added 'Jai Anusandhan' to former prime minister Lal Bahadur Shastri's famous slogan of 'Jai Jawan, Jai Kisan' and Atal Behari Vajpayee's 'Jai Vigyan'. 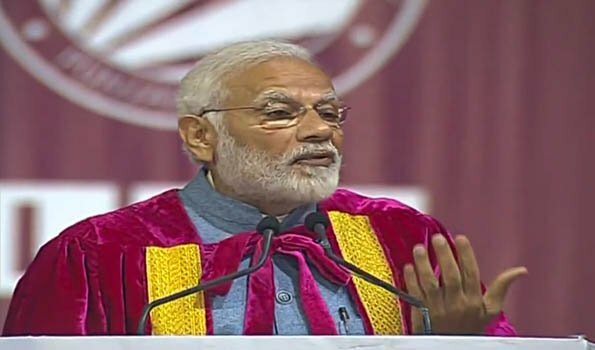 The Prime Minister was speaking on 'Future India: Science and Technology' at the 106th Indian Science Congress at Lovely Professional University here. Accompanied by Union Cabinet Minister Harsh Vardhan, Punjab Governor V P Singh Badnore and Union Minister of State Vijay Sampla, Mr Modi arrived at the venue at 1257 hrs. Mr Modi said the life and works of Indian scientists are a compelling testament of integration of deep fundamental insights with technology development and nation building. "Today's new slogan is 'Jai Jawan, Jai Kisan, Jai Vigyan and Jai Anusandhan'. I would like to add 'Jai Anusandhan' to it," he said. He said it was through science that India was transforming its present and working to secure its future. "2018 was a good year for Indian science. Our achievements this year include production of aviation grade biofuel, Divya Nayan -- a machine for visually impaired, inexpensive devices for diagnosis of cervical cancer, TB, dengue and a real-time landslide warning system," he said. "We need strong pathways to commercialisation that leverage our research and development achievements, through industrial products," he said. He also said the future is about convergence and connected technologies. "We should catalyse, harness and manage change for the nation's prosperity.